Brown Chinned Racer- Brown chinned racers are fast, sleek, slender and graceful Florida snakes. 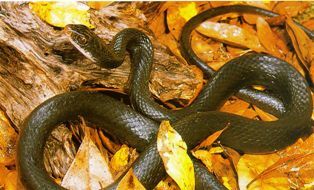 Similar to the Southern Black racer, this subspecies can be distinguished by its slate black color and its tan or brown lip scales and throat. This snake preys on rats, mice, frogs toads, lizards, birds and other snakes, swallowing its prey alive. This snake is not venomous but will probably try to bite if cornered. Southern Black Racer- Racers are large, active snakes with smooth, shiny scales. Adults average 23 to 50 inches in length, while young are about 15 inches long. Racers prefer dry open fields, meadows, forest clearings and prairies. They are active in the daylight hours and can be relatively easy to spot in the field because they often forage with their head and neck raised above their body. Racers often bask in the sun in low brush and can quickly disappear from view, thus the name “racer.” They are the only species that will occasionally charge at a person. This behavior is a bluff and the racer will retreat if challenged. Racers eat a variety of rodents, insects, amphibians, other reptiles, birds, and bird eggs. The Southern Black Racer is an excellent swimmer and climber, and is aptly named because it has incredible speed and is very difficult to capture. Despite being classified as a constrictor, the Racer is more likely to suffocate or crush its victim into the ground rather than coiling around it in typical constrictor fashion. Breeding and egg laying occurs between March and August. Up to 20 eggs are laid but like most reptiles, no interest is taken in hatching or rearing young. Newly hatched Racers are about 6" in length and rely on their juvenile camouflage for survival. Everglades Racer- A subspecies of the Southern Black Racer, the Everglades Racer looks similar, but can be identified by the lack of black coloration. 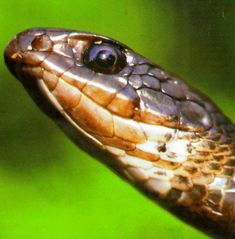 Everglades Racers are either grayish or blue-green above and has a whitish underside with a tinge of blue. A swift snake, the Everglades Racer is difficult to catch. This snake has a maximum length of six feet and can be found in the Everglades, Big Cypress Swamp, and the Upper Florida Keys in Florida. Everglades Racers are active during the day and feed on lizards, insects, moles, birds, eggs, small snakes, rodents and frogs. Rat Snake- Rat snakes are found throughout every southeastern state and most of the eastern and Midwestern states as far north as southern New England and southern Michigan Adult rat snakes are typically 3-5 feet, but large individuals may be more than 6 feet long. The appearance of rat snakes varies greatly throughout the geographic range. 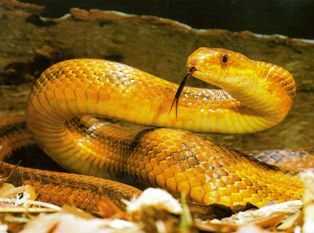 Yellow rat snakes are greenish, yellow, or orange with four dark stripes running the length of the body. Gray rat snakes are dark to light gray with darker gray or brown blotches. The juveniles of all subspecies resemble the gray rat. Rat snakes are among the most valuable Florida snakes because of their skill in killing rats and mice. The yellow rat snake is a powerful constrictor and is the best tree climber of all Florida snakes. 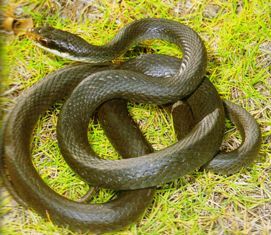 The gray rat or oak snake is found mostly in wooded areas around swamps. The grayed colored rat snake is most common in the Florida panhandle, but is also a common snake sold in pet stores. The Gulf Hammock and Everglades rat snakes are subspecies of the Florida rat snake. Red Rat Snake- The Red Rat Snake, often called the corn snake in Florida, live near pinelands, hardwood hammocks, swamps, agricultural fields, and residential areas. 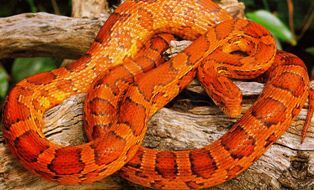 Corn snakes are one of the most colorful snakes in Florida. Adult Red rat Snakes are orangish-brown with black bordered orange, red, or brownish blotches. The belly usually is a black and white checkerboard pattern, though orange may also be present. The underside of the tail has 2 black stripes. Adult red rat snakes reach a length of 18-44 inches. Red rat Snakes are found throughout peninsular Florida. The species ranges west to Louisiana to north to southern New Jersey. Rough Green Snake- Rough Green Snakes are fairly long reaching lengths up to 32 inches. 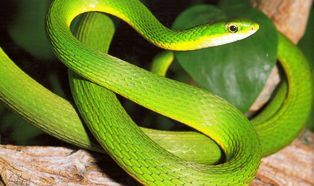 It is a slender, bright green snake with yellow or whitish belly that spends much of their time climbing in vegetation. Their bright green color easily distinguishes them from all other snakes in Florida. Rough Green Snakes are found throughout the Mid-Atlantic and Southeast from the Pine Barrens of New Jersey west to central Texas and south throughout Florida. Rough green snakes can be found in a variety of habitats but are most common in open forests and edge habitats. They can be particularly abundant along the margins of wetlands and rivers, where they search overhanging vegetation for insects. Rough Green Snakes are probably the most arboreal snakes in our region and spend the majority of their time hunting for insects, spiders, and other invertebrates in vegetation well above the ground. When encountered, green snakes often freeze, relying on their green coloration for camouflage.